There’s an interesting assumption going on behind the estimation of the output gaps (the difference between the economy’s current output and the economy’s estimated maximum potential output)–that not only did the economy decline during the recent crisis, but that the economy’s potential declined as well. This assumption leads to governments believing that their economies are less capable than perhaps they are, that the output gaps are not especially large, and that there is little revenue to be raised to offset stimulus spending, but what if it is not true? The idea comes from Capital Economics, a macroeconomics research company, has received attention from the Financial Times and Paul Krugman, and now it will receive attention from me as today’s topic. The principle reason for this has been the rate of inflation in the UK, which, until recently, was high enough to make it look like the economy was not operating far below potential. An economy operating persistently below potential usually has very low inflation or deflation because many workers and much capital remains idle. the great bulk of UK inflation these past few years reflects one-off factors: VAT increases, commodity prices, and import prices. Domestically generated inflation is low, and headline inflation is declining too. 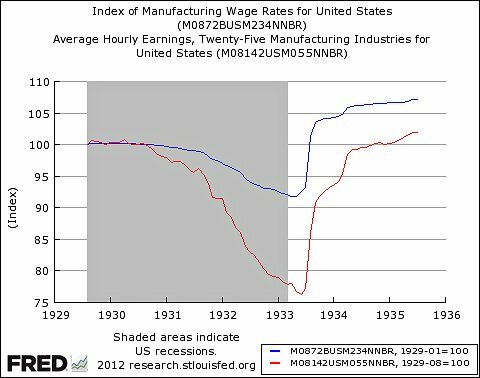 This illustrates that it is actually quite difficult to achieve extremely small amounts of inflation or any amount of deflation–and why countries like Spain are currently having a great amount of difficulty reducing their prices and wages through wage cuts, or what is often called “internal devaluation”. Between 2000 and 2008, household debt rose from 96% of US personal income to 128%; meanwhile, in Britain it rose from 105% to 160%, and in Spain from 69% to 130%. This represents around 386 billion dollars based on Trading Economics’ estimate of the UK GDP levels, or around 240 billion pounds. A boost in demand of that size would, if Capital Economics is correct, result in a rapid recovery in Britain. Spending reductions by Britain’s government only serve to further exacerbate the output gap. In the British government’s zeal to demonstrate “fiscal responsibility”, it has unnecessarily created a prolonged period of British economic stagnation in which the economy operates far below potential and millions of people remain unnecessarily out of work or underutilised. The cost of such a stimulus to Britain would be alleviated considerably on two fronts–the rate of inflation remains slightly higher than Britain’s interest rate on 10 year bonds, meaning that the British government is paid by investors to borrow their money, and the very large surge in growth that would result from proper fiscal policy would lead to a large boost in the government’s tax revenues. The output gap of 13.7% reflects the percentage of the potential at which the current British economy is operating–the potential itself is around 16% higher than current British GDP, so British tax revenues could expect to increase as much as 16%–as much as 92 billion pounds of the stimulus could be paid for in higher revenues in a single year if Britain attained its estimated potential GDP and did not fundamentally change the percentage of GDP taken in taxes by the state each year. The 92 billion pounds in higher revenue would pay for the stimulus in just three years, and that assumes no additional growth in the economy in line with further potential going forward, no shrinking of the debt via inflation, no other outside assisting factors at all. With other factors included, the timetable would be reduced further, and all future growth from potential would only mean higher revenues and higher profits for the government. The reality here is that the British government can invest in growth, can get a substantial return on that investment, and can close this output gap. Only pessimism about the British economy stands in the way, and the same situation may very well exist in other places. that what is paid is equal to what is received. In esnscee, . But Fisher was full or crap because statistical studies showed that his treatment of ‘V’ was wrong. In his book, The Purchasing Power of Money, Fisher treats V as a relative constant which makes the price level directly proportional to M. But the statistical studies have shown that is not the case. Individuals are not automatons who follow certain predetermined mathematical rules and they react to things other than just the money supply, particularly over the short term. Early in the game you may be able to expand the money supply rapidly without seeing the same level of increase in the price level. But as time passes the price levels catch up and finally surpass the change in the money supply later in the game. This is exactly why you get a blow off spike in prices late in hyperinflationary episodes that looked contained earlier on. It is this reliance on stupid formulas that do not reflect reality that causes many of our modern economic problems. As economists abandoned the sound theories that they knew so well and moved towards abstract ’empirical’ and ‘mathematical’ modelling studies that were far removed from reality the economy became less and less stable. Believe in the voodoo if you wish but a prudent man would bet with reality. If your scepticism of the models were warranted, Keynesian predictions throughout the recent crisis would not have been accurate. On the contrary, these models have vastly out-performed their competitors and proven themselves empirically verifiable over the last half decade. It is unscientific to say otherwise.